PRICE INCLUDES: Custom cards with your branding, envelopes, real handwriting of cards and hand addressed envelopes. postage is additional. Most importantly, you’ll get your own account manager who monitors your data for accuracy, zip codes, spelling errors and duplications – a real live person you can communicate with to make sure you get what you want. PICK YOUR PLAN based on your project needs. From birthday cards, to bulk mailings – send cards one at a time (thank you’s birthdays, client follow up, etc), or send a bulk mailing to your entire recipient list. Click LET’S GET STARTED so we can connect with you about your specific needs. Our services are designed to make your life easy! There is NO data entry on your part. Pick a card from our collection, or we can design one for you. Have a design already? You can send it to us, no problem. We can add your logo and branding, business cards or gift cards if you like. Send us your recipient list (with occasion dates if applicable). That’s it! We take it from there. Your account manager will send you samples, photos of finished cards, and reports upon mailing completion. WHY CHOOSE HANDWRITTEN CARDS? Handwritten cards provide an opportunity to engage with your clients, and a chance to entice them to come back to your business. The individual and unique touch that Sent Well provides with our personalized corporate cards will remind them why they chose your business in the first place. 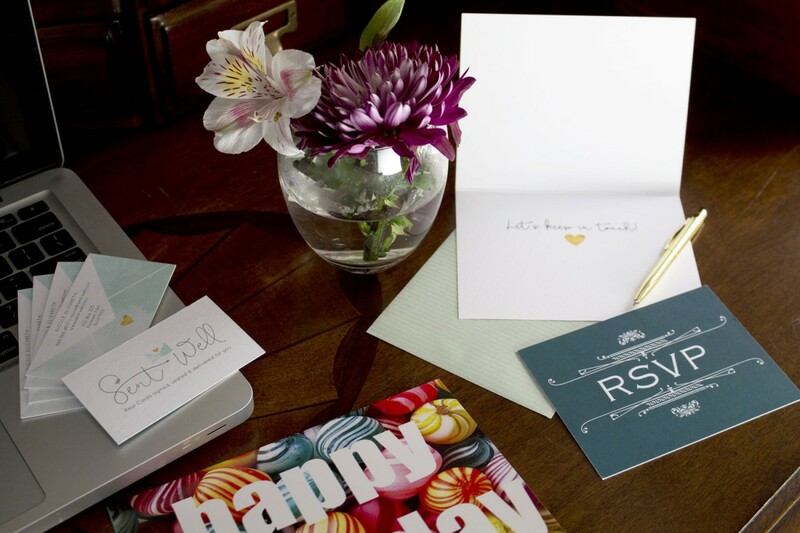 Our handwritten cards feel like the luxury they truly are. Our cards get opened much more than cards with “handwriting-like” fonts, we promise you that. Your clients will know the difference, and your thoughtfulness will be appreciated. Most of all, with computer printed cards, you literally get what you enter. If there is an error, it goes out that way. We are here as a second set of eyes, making sure your efforts are realized.